Mary Edna Brophy was born on a ranch in the small Canadian town of Blackie, Alberta, Canada on January 23, 1926. She was the daughter of Veronica (McGlone) and George Brophy. Mary Edna’s mother died in the flu epidemic of 1929 when Mary Edna was three years old. Her father hired a young housekeeper, whom Mary Edna deeply loved. She would put the children to sleep at night by telling them stories and teaching them poems. Mary Edna was also fortunate in having a teacher who instilled in all her students a deep love of poetry. These experiences, as anyone who ever lived with Mary Edna well knows, early awakened in her a deep love of poetry that never waned. Until her death, she could still recite spontaneously hundreds of verses. When she was six years old, her uncle Ambrose Brophy and aunt Ada came to Blackie and brought Mary Edna’s father and all the children back to live with them in St. Augustine, Ontario. Mary Edna had two brothers, Joseph and Edward and three sisters, Ursula, Agnes, and Mary Ada, who was Mary Edna’s twin sister. All her siblings have pre-deceased her. 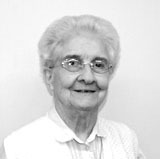 Mary Edna attended St. Augustine Grammar School and Wingham High School in St. Augustine, Ontario, graduating in 1945. She attended Wingham College for one year before entering Nursing School at St. Michael’s Hospital in Toronto. Following her graduation as a Registered Nurse in 1948, she continued to work at St. Michael’s Hospital until 1955. She worked briefly at Mercy Hospital in Orlando, FL before entering Maryknoll from Our Lady of Lourdes Parish (now St. Timothy’s) in Toronto, on September 2, 1955. At her Reception Mary Edna received her religious name, Sister M. Francis John. She returned to her baptismal name following Vatican II. She made her First Profession of Vows on June 24, 1958 at the Maryknoll Sisters Center, was assigned to Hong Kong the same year and made her Final Profession of Vows there in 1964. She spent her first year in Hong Kong studying Cantonese. She then served as a Laboratory Assistant in Physics and Chemistry at Maryknoll Convent School until Our Lady of Maryknoll Hospital opened its Out-patient Clinic in 1961. She worked at Maryknoll Hospital until 1965. Our Lady of Maryknoll Hospital was set up principally to care for refugees, starving and desperate, pouring into Kowloon from Mainland China. The in-patient and all the other departments of the hospital were ready to open on September 2, 1962. Nature was not kind that day. Typhoon Wanda struck with the eye of the storm making a direct hit on the Territory. All the Sisters were busy mopping up the new hospital’s flooded floors, when the first patient arrived. The roof of her wooden squatter hut had fallen on her head. She was obviously in a great deal of pain, but according to Mary Edna, “she never complained.” This experience made a lasting impression on Mary Edna, who developed a great love for the Chinese and described them as, “very open and trusting as well as extremely patient in their sufferings and misfortunes.” Sister Mary Edna has laid claims that she was privileged to have ministered to the hospital’s first patient that day. From 1965-1976, Sister Mary Edna served as supervisor of Caritas’ newly opened clinic in Ngau Tau Kok where she gave in-service training to nurse aides, taught health education, nutrition and supervised the well baby clinic. She also took on the responsibility to provide in-service training for midwives. From 1977-1979, Mary Edna worked in the Maryknoll Sisters Health Services at the Center, Maryknoll, NY. While on renewal, she attended a Clinical Pastoral Training course in Toronto. She returned to Hong Kong, and for the next ten years, she worked in the Pastoral Care Unit of the CARITAS Medical Centre. Over the years, Mary Edna came to realize that the local people in Hong Kong had achieved tremendous expertise in the medical and nursing fields. She was also aware that many people, caught up in this highly competitive and materialistic society, were searching for lasting values, she wrote, “My mission vision changed…. I have begun to see the need to reach out to them in a new way, to give deeper meaning and direction to their lives through pastoral ministry”. Returning to Hong Kong in 1992 after her renewal and Congregational Service, Sister Mary Edna became involved in Pastoral Care ministry at two large government hospitals: Kowloon Hospital and Kwang Wah Hospital, where she worked until 2004. As I did that habit make? Sister Mary Edna died rather suddenly on the morning of January 13, 2017 in the Maryknoll Sisters Home Care. She had donated her body to science. She was 90 years old, a Maryknoll Sister for 61 years, and she had spent 44 years in China. We welcome our brother Fr. Jack Sullivan, MM who will preside at the Memorial Mass for Sr. Mary Edna.